Incendies opens boldly. Director Denis Villeneuve barely gives the audience a chance to adjust to the darkness of the theatre before we're introduced to child soldiers in bold, direct close-ups, zooms and pans. Numerous characters enter the film in this manner - it's an inventive and powerful directorial choice. Alas, it's a film that, despite this vivid visual delivery, rarely gets beneath the surface of the characters. The extreme close-ups are a firm and unfortunate reminder that in Incendies what you see is often all you get. The child solider prologue lingering, there's a sudden shift in locations and tone. We're now in the office of a Quebec notary, reading out the will of a woman Nawal to her twin children Simon and Jeanne. Emotions - and not just sadness - are running high, and confusion and anger run even higher when notary Jean reveals that Nawal has left a mission of sorts for her children. There are two letters to be delivered before the will can finally be executed - cryptically, one for the 'father', and one for the 'brother'. Jeanne and Simon, as far as they aware, have no brother, and their father died long ago. Jeanne, though, is suitably intrigued by a mysterious old passport left behind by her mother, and soon embarks on a quest to Lebanon to uncover her mother's repressed past. The central mystery at the core of Incendies is the film's strongest point. Based on a play by Wajdi Mouawad, it's a tale that encompasses family tensions, war, revolution, political intrigue, assassinations and torture. It's a smorgasboard of extremities, although one grounded by a compelling and simple potential endgame. And said ending doesn't disappoint - everything comes crashing together in a shock reveal that is extremely well delivered. It's not one that eagle eyed viewers won't have spotted before the conclusive revelation, but it is still a surprisingly effective payoff to a labyrinthine plot. Alas, the time spent getting there isn't always as compelling or engaging. It's rare that the viewer will be bored as Mawal's odyssey plays out, and the story of one woman caught up in the Lebanese war is a fascinating one at the best of times. Yet the whole thing lacks originality, and very often relies on increasingly strenuous coincidences, exaggerations and narrative gaps. It's almost a necessity to build to the conclusion, but there are moments when everything seems more than a little ridiculous. Even a handful of moments where Villeneuve explicitly reminds the audience of the horrors of war feel like they should have been handled with some more originality. It doesn't really help that we have little time to get to know the characters or their motivations despite the fact that we spend so much time in their company (the film sneaks past the two hour mark). Characters - except for maybe Jeanne and Jean - only seem to be provoked into doing anything when the narrative demands it, and as a result their actions don't always seem entirely credible. Mawal largely remains an enigma throughout - partially necessitated by the plot's forward momentum and her role in it, but it means it is difficult to truly emotionally engage with her despite the often unbearable suffering she is subjected to. The frequent jumps back to the present are equally a mixed bag, and Simon as a character particularly suffers. He clearly has a troubled background with his mother, and yet it's one he only seems willing to confront when his sister finally demands he joins her on her quest for the truth. And it's even sometimes downright incredible - are we meant to believe Simon and Jeanne never questioned their mother's past during her life? 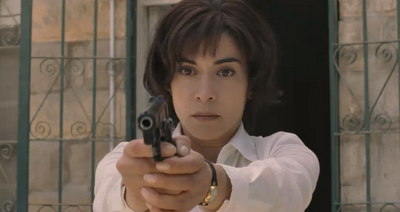 Perhaps I'm being overly cynical, and Incendies is far from a poor film. It's consistently compelling if only irregularly remarkable. It's most certainly well made - the previously mentioned close-up shots a pleasant trick in an otherwise conservatively shot film, barring a suspenseful and inventive sequence near the end. And one can't fault the performances. Perhaps it's merely that it is held back by its theatrical origins. But there is definitely an overarching sense that Incendies at its worst relies on conveniences. However, isn't that half the joy of artistic license? Incendies, in short, is a great story that takes a few unfortunate shortcuts to get where it ultimately needs to. What it lacks in emotion it makes up for in suspense and intrigue. Yet it is also a film that fails to truly engage with these people propelled into remarkable circumstances. A good film? Definitely. A scorcher? Not quite.